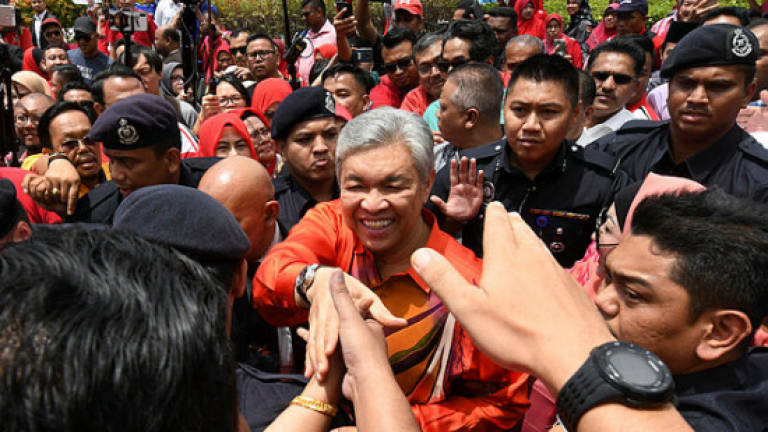 19 Oct 2018 / 20:05 H.
KUALA LUMPUR: Umno president Datuk Seri Dr Ahmad Zahid Hamidi pleaded not guilty in the sessions court today to 45 charges of criminal breach of trust (CBT), accepting bribes and money-laundering amounting to RM114,148,983.86. Ahmad Zahid, 65, who is also the former deputy prime minister, had his plea recorded before judge Azura Alwi after the charges were read out to him. The court allowed the Bagan Datuk MP bail of RM2 million in one surety and ordered him to surrender his passport to the court pending disposal of the case. The court ordered Ahmad Zahid to pay RM1 million of the bail amount today and the remainder by Oct 26. It set Dec 14 for mention of the case. Former Federal Court judge Datuk Seri Gopal Sri Ram, as senior DPP, led the prosecution team. He was assisted by DPPs Ahmad Akram Gharib, Mohamad Mustafa P. Kunyalam, T. Deepa Nair and Nadia Mohd Izhar. Ahmad Zahid was represented by 12 lawyers, led by Hisyam Teh Poh Teik. The other counsel included Datuk Ahmad Zaidi Zainal and Kitson Foong. Ahmad Zahid is accused of having committed 10 counts of CBT of RM20,833,132.99 entrusted to him as a trustee of the Yayasan Akal Budi foundation. He is alleged to have committed the offences at Affin Bank Berhad branch in Jalan Bunus, off Jalan Masjid India, here, between Jan 13, 2014, and Jan 11, 2016, under Section 409 of the Penal Code, which provides for a jail term of between two and 20 years, and whipping, as well as the liability of being fined, upon conviction. As for the eight charges of bribery, the 11th charge accuses Ahmad Zahid of having received a bribe from Mastoro Kenny IT Consultant & Services, in the form of a Public Islamic Bank Berhad cheque for RM250,000 belonging to Jogabonito Jewellery & Diamonds, through Junaith Asharab Md Shariff via a Maybank account of Lewis & Co. The 12th charge accuses him of having received a bribe from Mastoro Kenny IT Consultant & Services, in the form of 13 RHB Islamic Bank Berhad cheques for RM8 million belonging to Mastoro Kenny IT Consultant & Services, through Junaith Asharab Md Shariff via a Maybank account of Lewis & Co. The 13th charge accuses Ahmad Zahid of having received a bribe from Mastoro Kenny IT Consultant & Services, in the form of 10 RHB Islamic Bank Berhad cheques for RM5 million belonging to Berani & Jujur Trading, through Junaith Asharab Md Shariff via a Maybank account of Lewis & Co.
Ahmad Zahid is accused of having committed these three offences as an inducement to assist Mastoro Kenny IT Consultant & Services to secure MyEG projects handled by the Home Affairs Ministry. For the 14th charge, the former home affairs minister is accused of having received a bribe from one Chew Ben Ben, a director of Data Sonic Group Berhad, in the form of a Maybank cheque for RM5 million, belonging to Sarana Kencana Sdn Bhd via a Maybank account of Lewis & Co.
For the 15th charge, Ahmad Zahid is accused of receiving a bribe from Chew in the form of a Maybank cheque for RM1 million, belonging to Sarana Kencana via a Maybank account of Lewis & Co. He is accused of having committed these offences as payment to him as the home affairs minister for the transactions with Data Sonic Technologies Sdn Bhd, which was appointed in the procurement of the additional supply of passport chips for five years, or 12.5 million chips, to be inserted into the Malaysian Biodata Polycarbonate Passport for the Department of Immigration in direct negotiation at the Home Affairs Ministry to Data Sonic Technologies. For the 16th charge, he is accused of having received a bribe from one Azlan Shah Affril, a director of Profound Radiance Sdn Bhd, a Maybank cheque for RM300,000 belonging to Profound Radiance via a Maybank account of Lewis & Co.
For the 17th charge, Ahmad Zahid is accused of having received a bribe from Azlan Shah a Maybank cheque for RM1 million, belonging to Profound Radiance via a Maybank account of Lewis & Co.
For the 18th charge, he is accused of having received a bribe from Azlan Shah a Maybank cheque for RM700,000, belonging to Profound Radiance via a Maybank account of Lewis & Co.
Ahmad Zahid is accused of having these three offences as payment for himself as the home affairs minister to conduct any transactions with Profound Radiance as the operator of the one-stop centre service in Pakistan and Nepal, at the Home Affairs Ministry. He is accused of having committed all the offences at the Maybank branch at Dataran Maybank in Jalan Maarof, Bangsar, between July 15, 2016, and March 15, 2018, under Section 16(a)(B) of the Malaysian Anti-Corruption Commission (MACC) Act 2009 and is liable to be penalised under Section 24(1) of the same Act. If convicted, he is liable to a jail term of up to 20 years and a fine of not less than five times the bribe amount or RM10,000, whichever is higher. Ahmad Zahid also faces 27 charges of money-laundering involving RM72,063,618.15. For the first to 25th charges, he is accused of having been involved in money-laundering by engaging in direct transactions involving income from illegal activities. He is accused of having given instructions to deposit between RM600,000 and RM9.35 million, which is reportedly income from illegal activities, into two fixed deposit accounts via the Maybank account of Messrs Lewis & Co, advocates and solicitors. He is accused of having committed all the offences at the Maybank branch at Dataran Maybank in Jalan Maarof, Bangsar, between May 27, 2016, and April 11, 2018. For the 26th charge, Ahmad Zahid is accused of having committed a similar offence, that is having given instructions with regard to the purchase of two bungalows in the mukim of Kajang in the Hulu Langat district for RM5.9 million, which is income from illegal activities, with a Maybank cheque of Messrs Lewis & Co. He is accused of having committed the offence at the same place on Jan 9, 2017. For the 27th charge, Ahmad Zahid is accused of having committed a similar offence by instructing one Omar Abdullah, 46, to convert for him cash of RM6,885,270.20, which is income from illegal activities, into 30 cheques that were given to Messrs Lewis & Co for the opening of Maybank fixed deposit accounts. He is accused of having committed the offence at Marhaba Enterprise Sdn Bhd in Jalan Bukit Bintang on March 29, 2016, and July 15, 2016. The prosecution on all these charges is under Section 4(1)(a) of the Anti-Money Laundering, Anti-Terrorism Financing and Proceeds of Unlawful Activities Act 2001 and for which the penalty upon conviction, provided under Section 4(1) of the same act, is a maximum 15-year jail term and a fine of up to five times of the income from the illegal activities or RM5 million, whichever is higher. Three court interpreters took almost an hour to read out the charges to Ahmad Zahid who looked back now and then from the dock where he was standing to look at his family members and the Umno leaders in the gallery. Hisyam, who was by Ahmad Zahid's side, scrutinised the charges when the interpreters read them out to his client. Gopal proposed bail of RM2 million and Hisyam did not object, saying the amount was fair and reasonable. However, he requested for the amount to be paid in instalments of RM1 million today and the balance in two weeks time or before November. Gopal informed the court that he had received complaints from criminal lawyers questioning why an accused person is allowed to pay bail in instalments. "After the events of the last two months, where other accused have been granted to pay bail by instalments, I have been bombarded by members of the Criminal Bar on the matter as they (the accused) have to pay a lump sum on the same day. I really don't know how to answer. "There should be no exceptions. They have to provide the bail amount, otherwise they may have to be kept in custody," he said, adding that Ahmad Zahid should not be given any special treatment than other accused. "The accused should not be treated differently than any other accused who appear before you. We must move your lordship to decline the application to pay bail by instalments," he said. Hisyam replied that all persons are equal under the law based on Article 8(1) of the Federal Constitution. He also cited a case involving former prime minister Datuk Seri Najib Abdul Razak and his wife Datin Seri Rosmah Mansor, where the couple was allowed to pay their bail by instalments. "The purpose of bail is to secure the presence of the accused person in court. Our request for the bail to be paid by instalments is fair and reasonable," he said. Gopal countered that every person is equal before the law and entitled to equal protection and the test is universal and not select and also asked that Ahmad Zahid surrender his passport to the court. Hisyam replied that his client was not a flight risk, to which Gopal interjected that "the defence earlier referred to Najib and Rosmah's case. In the case, both had to surrender their passports," which drew laughter from gallery. Judge Azura allowed Ahmad Zahid to be released on bail of RM2 million with one surety and ordered him to surrender his passport to the court. "There is no question of me according special treatment to anyone," said the judge before the proceedings ended. Hisyam also informed the court that the defence would apply for the case to be transferred to the High Court and Gopal did not object.